The legendary Air Max range started way back in ‘87 with the release of the Air Max 1. Designed by Nike legend Tinker Hatfield, the Air Max 1 was the first sneaker to feature visible Air tech! 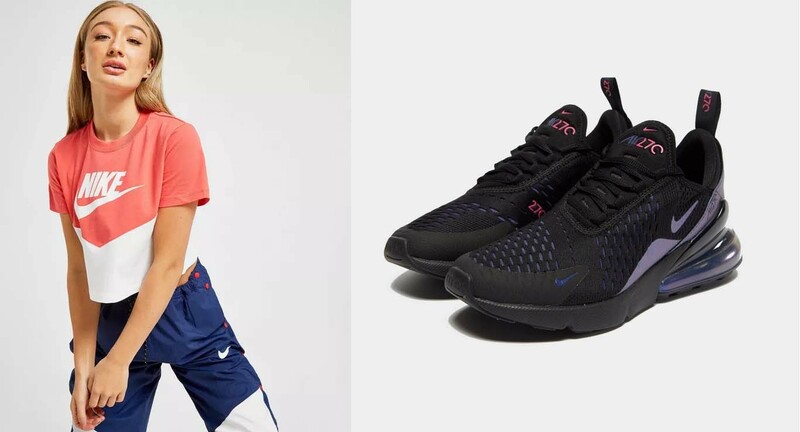 While letting you see how the cushioning was working in every step, they also brought a fresh look to Nike sneakers for standout performance and style. Delivering bold silhouettes for 30 years and counting, the Air Max range and visible Air tech has become a staple for every sneakerhead. In 2014, 27 years since the Air Max 1 first dropped, Nike lead a celebration of the iconic sneaker by re-releasing it in a limited-edition run with a fresh color to the midsole and “3.26” to the heel. The day turned into a 24-hour celebration of everything Air Max, with the sneakerhead community busting out their fave Air Max sneakers and documenting it on social media. With the limited-edition kicks selling out instantly and Air Max taking over online, March 26th became known the globally as Air Max Day. When did the Air VaporMax get released? Dropping exactly 2 years ago on Air Max Day 2017, the Air VaporMax switched up Max Air by ditching the midsole in favor of an Air tech and pod combination. Staying performance focused, Tinker Hatfield and Sean McDowell ensured the design of the cushioning gave runners support in all the right areas. Flywire cables bring a locked in fit, while Flyknit and mesh uppers add support and breathability. Continuing to evolve since they hit the streets, VaporMax brought a retro refresh with the Air VaporMax Plus sneakers, with the Air VaporMax Run Utility shoes getting you ready for rough weather. It’s essential you get the right look to go with these game-changing sneakers. 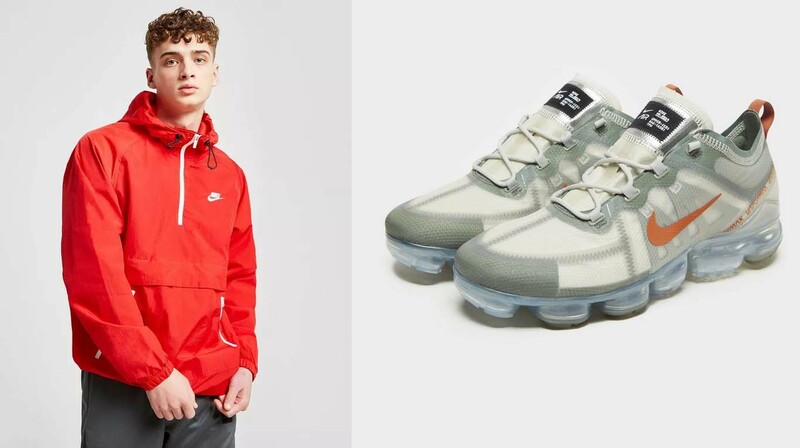 For the Guys: Stay covered and feeling fresh when you step out with the contrast anorak and track pants combo, with white Air Vapormax 2019 kicks to complete the look. 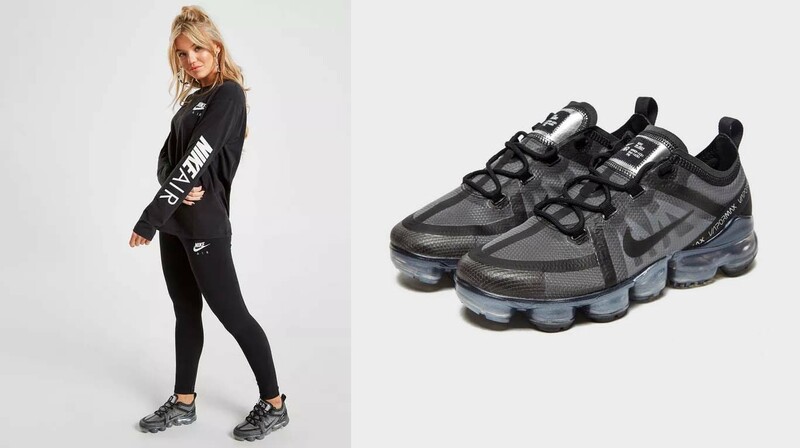 For the Gals: Get that off-duty style while keeping things sleek with this long sleeve top and leggings combo, paired up with matching Air VaporMax 2019 sneaks. For Juniors: Keep it simple yet standout at the weekends with this junior girls’ crop tee and leggings look. 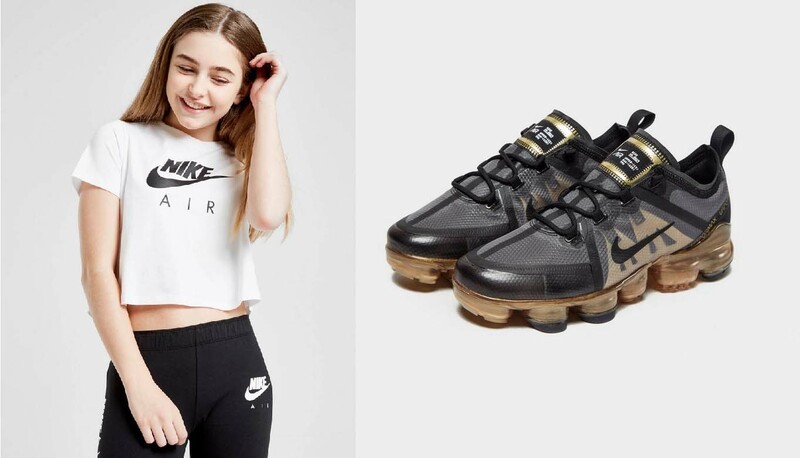 The Air VaporMax 2019 sneakers add a luxe look to step up your style. When did the Air Max 97 get released? First arriving on the scene in ’97, the Air Max 97 has been essential for the past 20+ years! The first Air Max sneaker to come with a full-length visible Air unit, the Air Max 97 was designed by sneaker-newcomer Christian Tresser. With Nike’s more prominent designers busy with other projects, Tresser was given the opportunity to make a name for himself. Its look was taken from nature, with the upper’s design resembling ripples in water. A full-length Air unit for next-level cushioning gave it a bold look, and the sneakers blew up from the start- finding popularity on the catwalk, in the clubs, and on the streets. 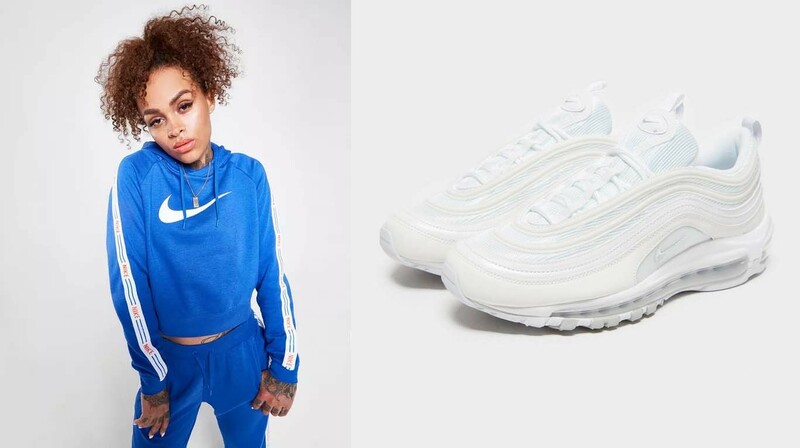 Given a boost in the UK thanks to Mel C of the Spice Girls, the Air Max 97s have remained one of Nike’s most popular sneaks since their release. So, what’s the best way to style out these essentials? For the Guys: Get an essential retro look with this tee and track pants combination complete with taping. 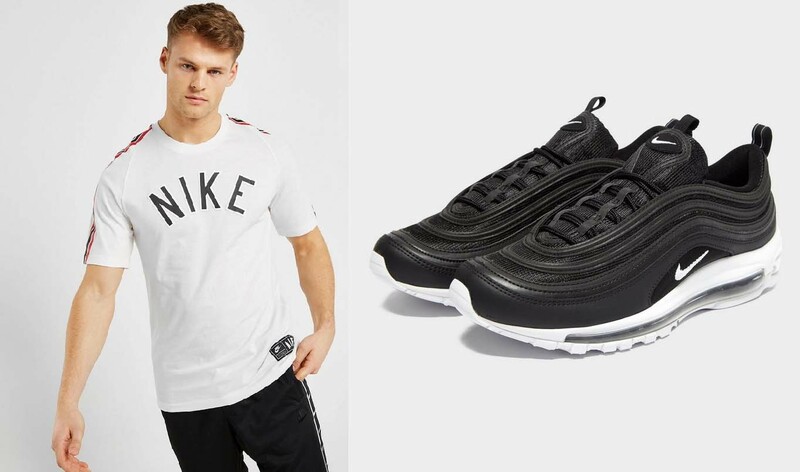 The Air Max 97s give the look a ’90s boost! For the Gals: Get lookin’ bold in blue with this hoodie and matching joggers. With some fresh white Air Max 97s, you’ll be feeling the retro vibes. For Juniors: Feelin’ the blue and lookin’ fresh! 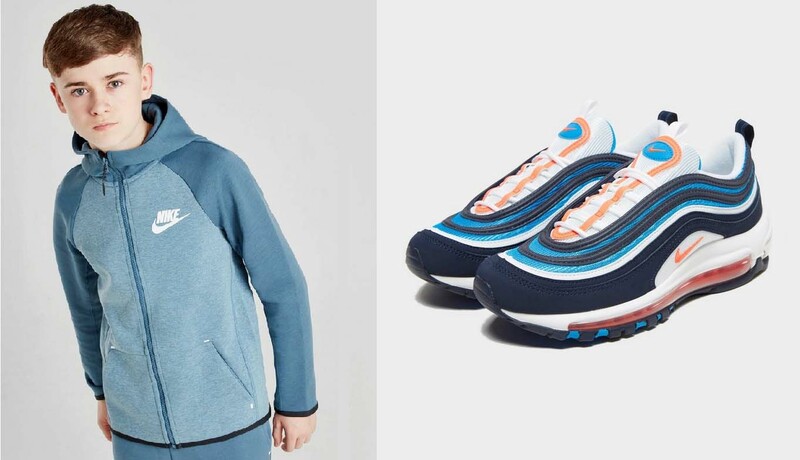 The tonal hoodie and fleece joggers make a statement, while the Air Max 97s take the look next level. When did the Air Max 95 get released? With previous Air Max sneakers bringing gradual change with every iteration, the Air Max 95 switched things up when it dropped in ’95. With basketball silhouettes dominating the early ’90s, the Air Max 95 was given a runner look with a street edge by designer Sergio Lozano. Its iconic look differed immensely from previous Air Max styles, and was inspired by human anatomy. A layered upper represented muscle, the nylon eyelets ribs, and the midsole acted as the spine. In this midsole we saw the first evolution of visible Air with dual-Air units to the forefoot and heel, bringing unique cushioning across your feet. With Essential and Ultra editions keeping the sneakers fresh, they have remained popular for the past 20+ years with celebs like Justin Timberlake, LeBron James, Kim K, and Halsey regularly rockin’ the street essentials. 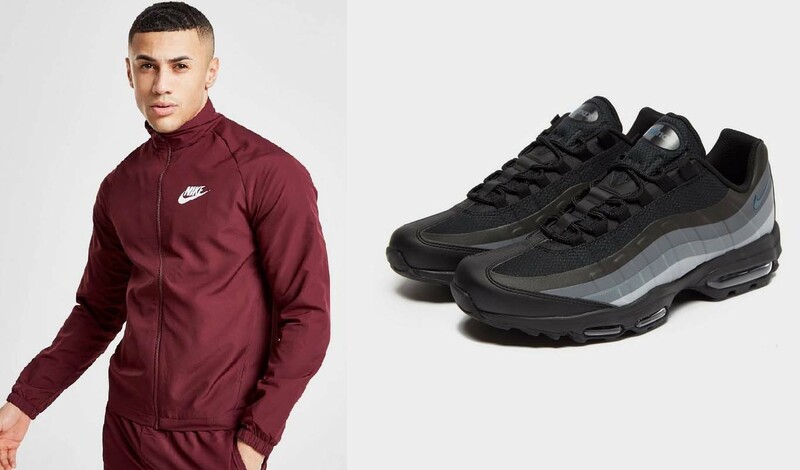 For the Guys: Get the complete look that’s bringing bold style with this burgundy tracksuit, while black Air Max 95s give you a smooth finish, ready for the streets. 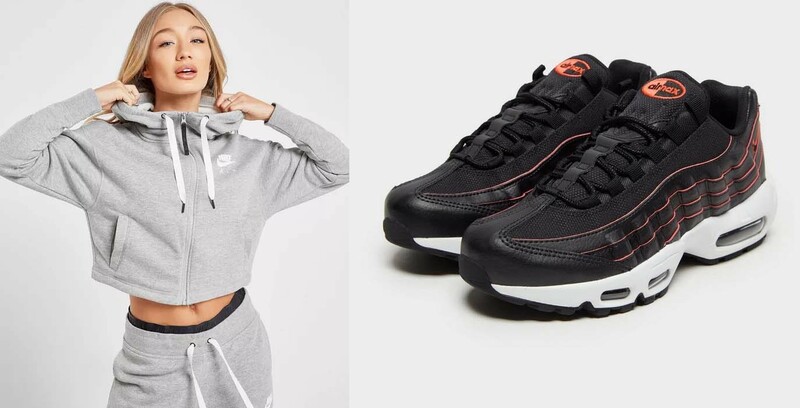 For the Gals: Refresh your style with a relaxed look in this grey crop hoodie and joggers combo, and get some contrasting black Air Max 95s for a pumped up finish. 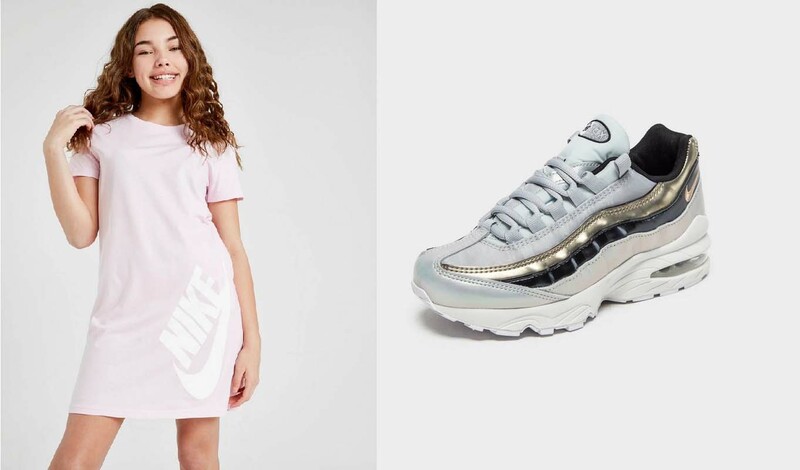 For Juniors: Get some simple and effective style with this chilled out t-shirt dress along with silver and gold Air Max 95 freshness! When did the Air Max 270 get released? Giving you a boost and lookin’ bold, the Air Max 270 first dropped at the start of 2018. It was the first purely lifestyle sneaker to feature visible Air tech and also had the tallest ever heel unit; coming in a 32mm – before being surpassed by the Air Max 720. Originally dropping with a mesh upper, the sneaker soon received a Flyknit upgrade for a fresh look and feel. It was originally intended to be a mash up of the Air Max 93 AND Air Max 180. While this idea was scrapped, the influence of the iconic ‘90s sneakers is clear to see. 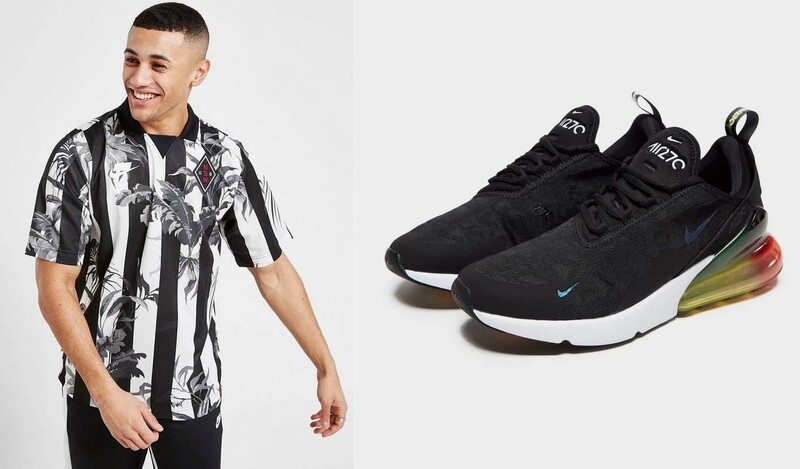 For the Guys: Add some heritage soccer style to your colorful Air Max 270s, with this print tee and sleek joggers! For the Gals: Bring some color block style to your off-duty days along with an iridescent sneaker look in this crop top, popper pants, and Air Max 270s. 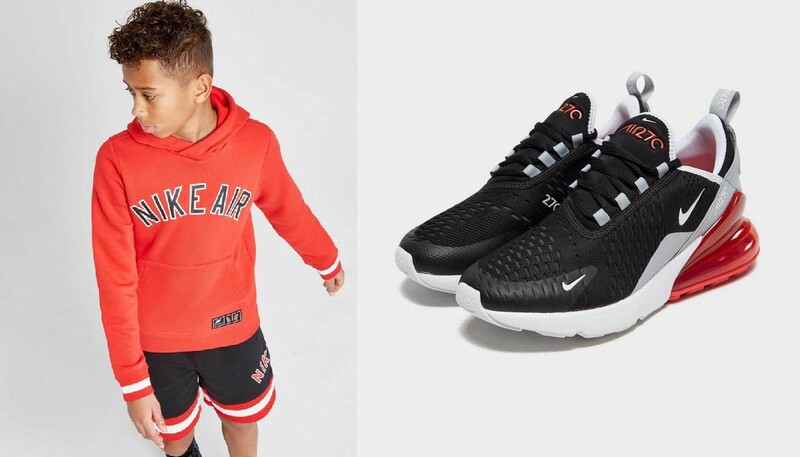 For Juniors: Get the ultimate chilled out Air look with this bold red hoodie, hoop style shorts, and matching Air Max 270s. Celebrate Air Max Day by styling up your sneaks with the freshest looks from Nike. Check out all the Air VaporMax, Air Max 97, Air Max 95, and Air Max 270 sneakers we have to offer! Make sure you shop the complete looks by stopping by one of our 5 stores and checking out our men’s, women’s, and juniors’ collections.